The chartering process is one of the oldest traditions in Scouting. It is the formal document that certifies the agreement between a Chartered Partner – an organization that agrees to utilize Scouting as a part of its service to youth and community outreach – and the Boy Scouts of America, setting expectations for the quality of program to be delivered to the Charter Partner’s youth population. The BSA grants charters to sponsoring (chartered) organizations who must report to Scouting annually to renew their local charters. 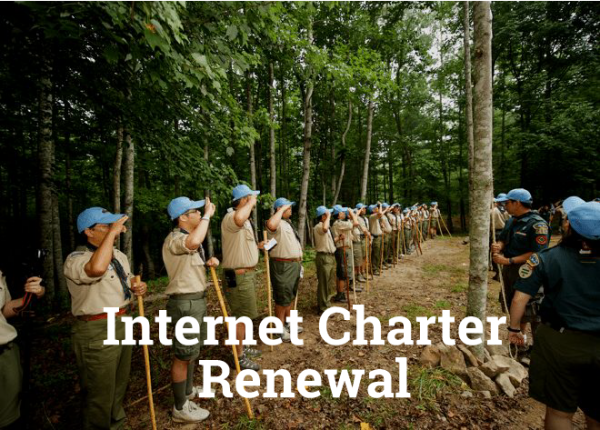 Rechartering is the process where a Scout unit renews its charter as an official part of the Boy Scouts of America. Online access will be available October 1, 2018. All unit charters are to be turned in no later than the November Roundtable. Units using the Cash/check option must also submit a completed Final Recharter Checklist. An access code must be used by units to log in. You must register as a First Time User on your initial logon to the system for 2018. After initial registration you can enter the system as a Returning User. Stages and steps remain the same as 2017. Youth Protection Training (YPT) taken after February 1, 2018 is required for all adults. You will get an error message if training is not current and will not be allowed to process the charter with those adults. Registered adults will receive notifications that their YPT has expired or is about to expire before charter renewal. Electronic authorization is available for the chartered organization representative (COR). There will be no more signatures to obtain or rosters to turn in if your unit chooses this option. Two payment options will be available. Online payment option: Units can elect to pay online by credit card. You will receive a payment confirmation. Accident and sickness insurance fee will be included in the unit fee calculation ($1.00/member). Cash/check option: Units that elect this option will print the renewal application. The fee shown on the summary page does NOT include the Accident and sickness insurance fee. This will need to be added to the amount due to the council. Use the Recharter Final checklist to help with the calculations. If you are an experienced user, go ahead and click on the INTERNET RECHARTER button in RED now. If you want to review the process or need a lot of guidance, use the Internet Recharter Help Guide listed below under “Resources”. Click on the button when you are ready. Remember, you must initially log-in as a “First Time User” – last year’s recharter season doesn’t count for this fall! If you used the on-line payment method and the electronic authorization, please print a copy of your charter application for your Commissioner or USE. Be sure to include all new adult applications with a Youth Protection certificates. Attach a check payable to Michigan Crossroads Council or your Field Service Council for the prorated 2018 fees any new applications. Be sure to include the $1.00 per person Accident & sickness insurance fee. Use the Recharter Final checklist to help with the calculations. If you used the on-line payment method and did not use the electronic authorization, please print a copy of your charter application for your Commissioner or USE. You will need to get the appropriate signatures. Be sure to include all new adult applications with a Youth Protection certificate. Attach a check payable to Michigan Crossroads Council or your Field Service Council for the prorated 2018 fees any new applications. Be sure to include the $1.00 per person Accident & sickness insurance fee. Use the Recharter Final checklist to help with the calculations. If you used the Cash/Check payment method and the electronic authorization, please follow these steps. Attach a check payable to Michigan Crossroads Council or your Field Service Council. In addition to the system calculated registration fees, $1.00 per person MUST be included for insurance for anyone charged a registration fee. Use the Recharter Final checklist to help with the calculations. The insurance fee will NOT compute in the on-line charter renewal process but MUST be included in the total payment. Have the entire package checked by a Commissioner or your Unit Serving Executive. See the “Final Recharter Checklist” in Recharter Resources below. The completed checklist must be turned in with the charter package. If you used the Cash/Check payment method and did not use the electronic authorization, please follow these steps. The insurance fee will NOT compute in the on-line charter renewal process but MUST be included in the total payment. NOTE: You have a choice of which charter application version to print. Both versions print the same cover page information. The Renewal Report E-Z version lists only changes and exceptions. The Renewal Application version also includes a full roster. Either version is acceptable. If you made a lot of changes, we recommend the Renewal Application version. You can actually save and print both versions. Just don’t mix up the pages. Often the person answering the phone at your local Scout Service Center can answer your question if it is a general one. If the question is other than general, your Unit Serving Executive is the place to start. They are familiar with your unit and are happy to help. If your Executive is not available or the issue is complex you can contact Birdie Sisco at birdie.sisco@scouting.org. Birdie is the Michigan Crossroads Council Membership Shared Services Coordinator.